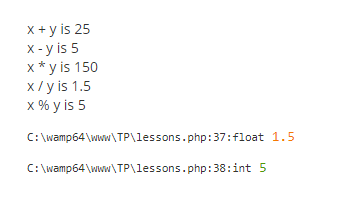 In this lesson, you will learn how to use PHP operators to perform arithmetic and logic operations on the data. An operator takes one or more variable known as operands, to manipulate data items. PHP has followed the syntax of C and Perl for its operators. Modulus (Known as Mod) operator (%) returns the remainder of the division of the first operand by the second operand. There are two operators to increase and decrease operands by one. These need only one variable. Increment operator (++) returns the variable after adding 1 to the value. This code will display 10 as echo statement and increment operation will be performed afterward. Decrement operator (–) returns the variable after subtracting 1 to the value. This code will display 10 as echo statement and decrement operation will be performed afterward. Assigning a value to a variable is where these operators are used. They could be simple as assigning the value to the performing arithmetic operation and then assigning values. Let’s say you have to swap values of two variables. The assignment operator $x = 10 will assign an integer value to $x. using $temp = $x will assign $x’s value 10 to $temp. The operator += is to add the value on the right side to the variable on the left side. The statement $x +=$y is equal to $x = $x +$y. To determine in which order operators are evaluated in a single mathematical operation. Each operator is assigned precedence. Some operators have equal precedence e.g. precedence of add (+) and subtract(-) is equal. Identity operator (===) returns true if both operands/values have the same data type. Inequality operator (!=) returns true if both operands are not equal. Greater than (>) returns true if the value on the left is greater than the value on the right. Greater than or equal (>=) returns true if the value on the left is greater or equal to value on the right. Less than (<) returns true if the value on the left is less than the value on the right side. Less than or equal (<=) returns true if the value on the left is less than or equal to the value on the right. Bitwise operators perform operations on the binary representations of the variables/values. Shift right operator (>>) shifts the bits in the left-side operand right by the number of places specified by the operand on the right side.